There is a demand for 100,000 square meters of residential space more than offered at any moment in Belgrade, and everything built is immediately sold. The average price of apartments in 2018 was EUR 1,190 per square meters in old facilities and EUR 2,050 in new ones, an increase by 7% compared to 2017. Although this segment of the real estate market is very active, the real estate consulting company CBRE says that sales prices will remain stable in the upcoming period. The situation in the office space market is similar, with rent prices remaining unchanged in 2019. The increase in the construction will only impact the price of rent in retail. In the first ten months of 2018, building permits were issued in Belgrade for over 700,000 square meters of various category premises. This includes around 2,000 new apartments in planning. – Although the prices have been growing in the past few years, the sale of apartments is on the rise. Most of them are bought before they are built, and as many as 82% of residential units are sold for cash. However, the demand still exceeds the supply. 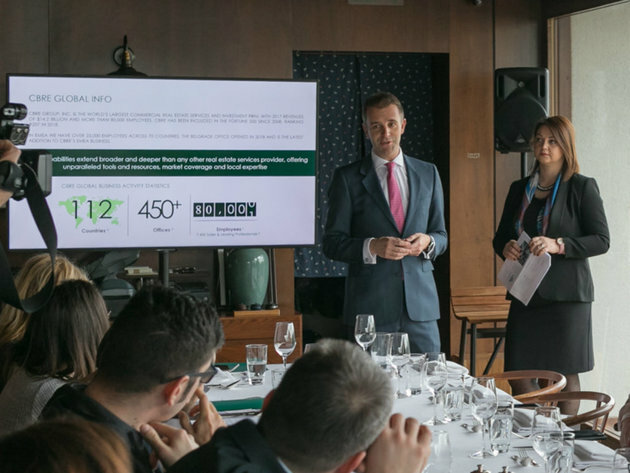 As before, the most expensive apartments will be those in Vracar, Stari Grad and Savski Venac – explains Andrew Peirson, Managing Director of CBRE for Southeast Europe. When it comes to the price of a square meter in the major cities in the region, apartments are more expensive in Zagreb, Ljubljana and several seaside tourist centers, whereas the prices of apartments in Sarajevo, Podgorica and Skopje are lower than in Belgrade. The rent prices are also higher in Belgrade when it comes to office space. This is caused by the low degree of availability of free offices, which is currently below 4%. At the moment, on top of the existing 450,000 square meters in office buildings, a new 140,000 square meters of A-class office space is being built. The construction of 60,000 square meters is expected to be completed in 2019. This will increase the availability of office space by close to 10%, which is the minimum for attracting more big renters. Most of the space will be concentrated in New Belgrade. The average monthly rent, which ranged between 15.5 and 16.5 euros per square meters last year, will remain at that level in 2019, whereas a drop of up to 5% is expected in 2020, CBRE projects. The construction in retail remains focus on Belgrade and large format shopping centers. At the current rates of free space of nearly zero percent, rent prices are up to 40% higher than in certain cities in the region. – The existing 150,000 square meters in Belgrade will be supplemented with another 34,000 square meters in 2019 and 137,000 square meters in 2020, by which we mean modern shopping centers. The increase in the amount of available space will lead to the coming of new brands to the market and the intensifying of their activities. The lowering of the current rent prices, which are 27 to 29 euros per square meters a month at the moment, by up to 20% from 2021 will eventually enable renters to offer goods at lower prices – Peirson explains. He adds that, by 2025, millennials will become the biggest demographic group in Europe, entering their primary consumer years and thereby becoming the biggest providers of demand in the field of retail real estate. Analyzing the region, CBRE points out that, in 2019, the key thing will be to attract new buyers to all SEE countries, focusing on office space, and Zagreb, Belgrade and Sofia have real estate which should prove to be attractive. In 2018, building permits for the construction of around 2,000 new apartments were issued. The price of a square meter is EUR 1,190 in old buildings and EUR 2,050 in new ones, an increase of 7% compared to 2017. As many as 82% of residential units are sold for cash, and the demand still exceeds the demand, so the prices will remain stable in the upcoming period. There are currently 485,000 m2 of A-class office space in Belgrade at the moment. More than 95% of A-class office space is located in New Belgrade. The average monthly rent in 2018 was 15.5 to 16.5 euros per square meter. Office space occupancy in Belgrade is 96%. The city will get 60,000 m2 of new office space in 2019, whereas the office space area will increase to 140,000 m2 by the end of 2020. Rent prices will only drop in 2021. There is currently an expansion of modern shopping centers in Belgrade, and there are currently 150,000 m2 in shopping center of the “Western type” in the Serbian capital. In 2019, Belgrade will get a new 34,000 m2 and then another 137,000 m2 in 2020. There is currently no free space, so retail chains are postponing entering the market. Monthly rents are high – 27 to 29 euros per square meter. In the upcoming period, the amount of available space is expected to increase, as is the entrance of new brands to the markets, as well as the intensifying of their activities, whereas the lowering of rent prices is expected in 2020.